Despite the natural look of this set-up, most of what’s here is a jumble. The Discus are domesticated variants and the Clown loach among the Cardinal tetra suggests that biotope was the last thing on this aquarist’s mind. Plants follow the same chaotic theme — with Asian, Madagascan and South American all brought together under one roof. Some aquarists will be horrified that the tank overhangs its frame, others might embrace this, but I think all will agree that the bespoke design is appealing, even down to the metal overflow and return pipes that sit inside. It has to be asked how the square shaped metal pipes have been plumbed through the base of the tank with such apparent ease, but the effect shows that such a logistical challenge has been successfully overcome. The lighting that sits above is of a brand unrecognised by the author, but scrutiny suggests that these canopies are based around high output fluorescent tubes rather than power-gobbling halides. I’d question the tank’s location in the house. If I’m not mistaken, those doors lurking in the background look like ovens to me, suggesting that this tank might be subject to the occasional fluctuation in temperature – not to mention the risk of being knocked by flustered cooks. Whatever the potential risks, the fish themselves look happy with their lot, and the tank remains an impressive visual feast, irrespective of how much a purist you might profess to be. Tank: It looks to be Optiwhite, braceless, and around 150 x 60 x 60cm/60 x 24 x 24”. 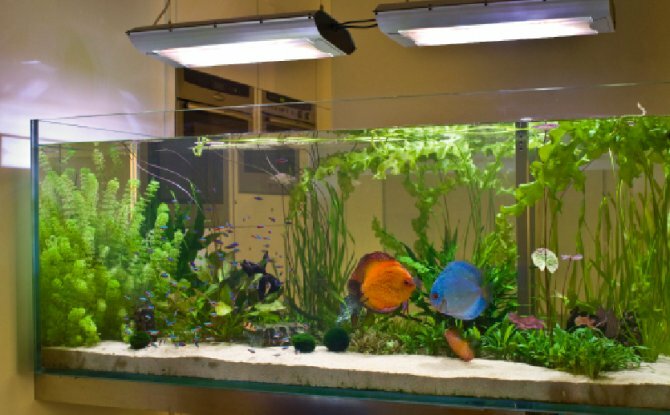 On its own, this would set an aquarist back a good £1,350. Frame: For such bespoke structure I’d be surprised to see much change from £750 or so. Assuming that it has been constructed into the wall, I’d push that guesstimate up closer to £1,200. Filtration: If not using a sump system, then the canister wouldn’t be any smaller than an Eheim 2080 Professional, at £435 or so. You’ll also need the media that Eheim don’t supply, so be prepared to cough up another £110. Heating: An inline heater is expected. Consider at least two 300w Hydor inlines. At full retail, expect to pay £59.99 for each. Lighting: Two T5 high output canopies can be picked up for about £150 each. Substrate and décor: It’s just sand and wood, so should cost no more than £75. Plants: To buy mature plants to fill this tank, look at spending at least £100. Fish: Discus can be picked up from around £35 each at the size shown, but that shoal of Cardinals would have been a good £200 or more. Total: All in, but excluding sundries and other hidden costs this may be £3959.98.